We're delighted you have chosen to host your gallery with us, and we will try to establish and maintain a high standard of service and availability. The gallery software is extremely easy to use, so you can probably just start right in. However, creating your first nested gallery can be a little disorienting, so you might want to scan the following hints. Notice that your gallery name is in the upper left corner, and there's a link to the list of all ShutterFreaks galleries in the upper right corner. Click on the login link in the upper right corner, and log in, using your login name and the password we sent you. Passwords and User Names are case-sensitive. As you can see, your menus are in the upper right corner. Your album may contain a placeholder photo which you can view (by clicking it) and then remove. To show the sidebar, you can click "Sidebar" in the top-right menu, or click the icon at top-left. This step isn't required, and if you're happy with the way your gallery looks, you may just want to skip down to "Creating Nested Albums." If you do want to change the appearance of your gallery, from your top-level album, show the Sidebar and choose "Edit Album." Here's where you can change your gallery's title, description, etc. Note: please do NOT change the Name in the top area (labeled "The name of this item on your hard disk"). That would change the URL of your gallery, breaking all links to it, including our link from the gallery index page. Image size - we recommend leaving this blank and only uploading web sized images. You are on your own here. there are several different themes. Each has several settings. It's your album :). Just pick a theme from the list, and then click "Choose Theme." Note that you can apply this theme to all sub-albums, or have a different theme for each album. After you have chosen your theme, you have the option of configuring it to your personal tastes. If you are feeling creative, try the Color pack option about half way down the page. When you have completed your edits, but sure to Click 'Save Theme Setting', or you can use Reset to put the settings back as you found them. Again, you can apply these settings to just the current album, or to all of your albums that use this theme. You may store photos at the top level of your gallery if you want, but we believe that you will find it more effective to create "Nested Albums" in which to store your photos. This allows you to organize your photos by category, such as "My Trip to Bermuda" or "Landscapes." To create a nested album, click "Sidebar," and then click "Add Album" in the left menu. You will be asked to give your album a name, title, etc. When you're done, scroll down and click "Create." You will get the "Album Created Successfully" notice at the top of the "Edit Album" screen, which has several tabs where you can change the default album settings. Click "Back to Album" in the left menu. You'll see your new album, which says "no thumbnail." Click "No Thumbnail," which will put you inside your newly-created album. Click "Add a Photo," and upload some photos from your hard disk. To add photos, click "Add a Photo" if it's visible. If not, click "Sidebar," and choose "Add Items." Then browse your hard disk to specify the the images you want to upload. Click "Browse," browse to the first image you wish to add, and click "Open" at the bottom of the page. Repeat with the next Browse button. Note the "More Upload Boxes..." under the bottom Caption window. You can continue to add Upload Boxes and browse to more images. When you have selected all of images, be sure to click "Add Items" at the bottom of the page. Note that you can upload Zip files. It is easier when adding multiple images to first put them in a Zip and then just upload it. Gallery will unzip the file automatically. The first photo you add becomes the one that shows on your main gallery page as a thumbnail. That can be changed later. In the menu, click your gallery name to move up to your top-level gallery. You will see the thumbnail of one of your photos, which will represent the album you just created. Under the thumbnail, you will see the title of your album. You'll also see how many photos you currently have in that album. 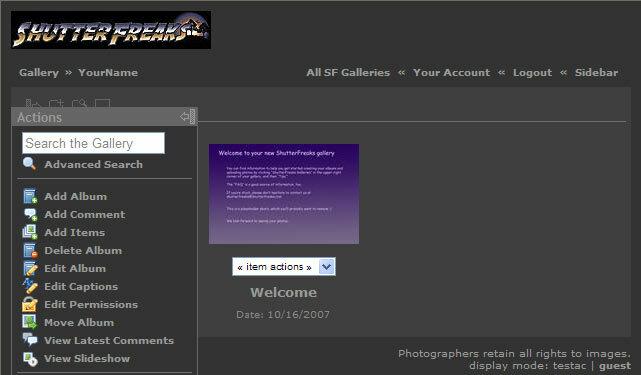 Please check out our Gallery FAQ for much more information about using and changing your gallery, as well as help with common problems. The remainder of the Options are pretty much self explanatory, or we haven't tried them and have no idea what they do or how they do it :). Please let us know if you have problems or questions at shutterfreaks@shutterfreaks.com.